In Australian media news this week, News Corp commemorates the Anzac centenary by bringing ten wartime Australians to social media, Audi enlists Fairfax to produce a long-read series of native advertising articles, OPSM’s ‘Penny the Pirate’ campaign wins media awards for OMD, and Facebook launches training for marketers. 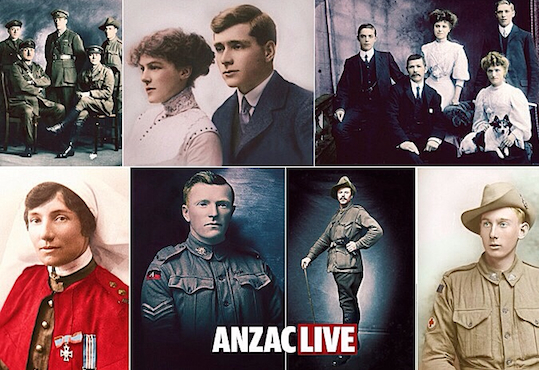 News Corp Australia has launched an innovative new social media project to commemorate the Anzac centenary. 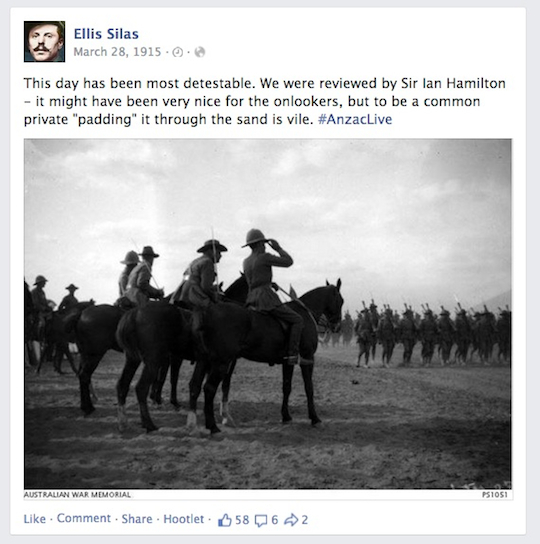 AnzacLive uses Facebook, Twitter and Instagram to bring to life ten real Australians’ wartime experiences, allowing audiences to communicate with these characters as if in a live conversation across time. As part of the project, launched yesterday, News Corp has created Facebook profiles for the ten characters including Alice Ross-King, a nurse who tended Gallipoli’s wounded, Archie Barwick, a digger from Tasmania and John Monash, an engineer from Victoria who rose to become one of Australia’s best-known military figures. News Corp reporters Tony Love, Peter Law and Nathanael Cooper will operate as “custodians” of the characters, drawing on the characters’ diary entries and letters to post comments and respond to questions on the page, as if in real-time from 1915. On Twitter and Instagram the project will use the hashtag #AnzacLive. News Corp also plans to mark the Anzac centenary by launching an exclusive, limited-edition 14-piece coin collection, available with the purchase of metro and regional newspapers from Saturday, 11 April to Friday, 24 April. Each masthead will also produce souvenir editions, lift-outs and detailed news coverage of the special events at Gallipoli. 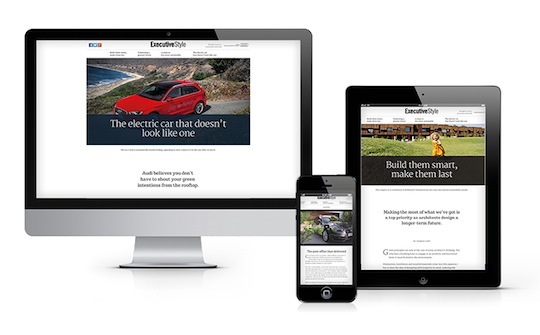 Fairfax Media has produced a ‘long read’ native advertising series in partnership with the Audi A3 e-tron, designed to reflect the interests and passions of Audi drivers. Hosted in its Executive Style section of Business Day, The Audi A3 e-tron ‘Long Read’ series includes articles, videos, galleries, maps and infographics exploring topics including sustainability in architecture, fashion, automotive and lifestyle. MediaCom senior digital executive James Wainwright said the custom content was vital to deliver the education needed to introduce the e-tron to the Australian market. The e-tron is the first premium compact car with plug-in hybrid drive available in Australia. It will be released mid-year but pre-orders are open now. “It’s becoming increasingly important to connect brands to audiences through relevant, in-depth content,” Wainwright says. OMD has won four gold awards for its ‘Penny the Pirate’ campaign for OPSM at the Media Asia Pacific Awards in Singapore. OPSM kicked off the ‘Penny the Pirate’ campaign with a free tablet app and book that enabled parents to screen their children’s eyes at home through storytelling. OMD won the overall Campaign of the Year award, as well as gold awards in the categories for effectiveness, best communications strategy and best targeted campaign, making it the most-awarded media agency on the night. Facebook has launched a suite of resources for marketers and small business owners to help improve their use of the platform for effective brand promotion. Blueprint has been designed as ‘training for agencies and big brands’ and features online courses, in-person training and certification. Learn How has been designed for small businesses and marketers new to Facebook, which includes videos, images and step-by-step instructions on using Facebook pages and ads.